The bold, bright colors of India leap off the page in this fresh and funny picture book retelling of how Ganesha came to help write the epic poem of Hindu literature, the Mahabharata. Ganesha is just like any other kid, except that he has the head of an elephant and rides around on a magical mouse. 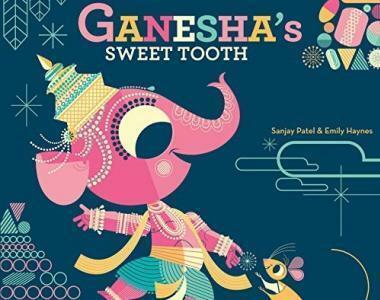 And he loves sweets, but when Ganesha insists on biting into a super jumbo jawbreaker laddoo, his tusk breaks off! With the help of the wise poet Vyasa, and his friend Mr. Mouse, Ganesha learns that what seems broken can be quite useful after all. With vibrant, graphic illustrations, expressive characters, and offbeat humor, this is a wonderfully inventive rendition of a classic tale. Repeats every day until Sun Feb 17 2019 except Thu Feb 14 2019.